3-Piperidino-1-(3,4-methylenedioxyphenyl)-1-propanone, referfed to as 1'-oxosafrole-piperidine in this article, is a very minor metabolite that forms after the oral ingestion or topical use of safrole. It's an adduct of 1'-oxosafrole and piperidine. 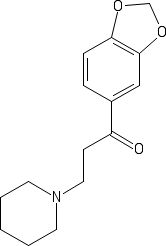 This piperidine based alkaloid metabolite of safrole is presumed to be partially responsible for the psychedelic effects of nutmeg and the rare psychedelic effects attributed to sassafras. This alkaloid has not been tested in man. 1'-oxosafrole-piperidine is not very stable. Its prone to decomposition, and easily decomposes during analysis. However it decomposes less rapidly than the corresponding 1'-oxoelemicin-piperidine adduct. Prolonged exposure to air, alkali, silica gel or heat decomposes 1'-oxosafrole-piperidine into an allylic ketone and piperidine. In vitro tests show that 1'-oxosafrole-piperidine antagonizes human dopamine D3 receptor sites.